We walked on the track and were ushered to a false entrance on the other side of the palace. A guide was assigned to us who from then on, censored our every move "Don't go there. Walk faster. Dont' talk. No cellphones allowed. Don't touch please. Do you even want to see upstairs? I can't take you there once the babus come back.." and other imperatives. He just won't let us enjoy the beauty at our own pace and instead would easily feed you with misinformation if you're not aware of it. 'That one is a Raja Ravi Varma painting, depicting the Raja's daughter' he said pointing towards 3 different styles of painting. So either Raja Ravi Varma was an eccentric painter who was unable to recreate a face or the Raja's daughter was Mystique. The marble floors and the intricate wooden ceilings were the primary reasons for calling this place 'a palace'. My art enthusiast friend commented that the house is Neoclassical in style with large Greek Corinthian columns as pillars all around it. The large open courtyard, however, is typically Bengali with the veranda at one end of it for the annual Kali Puja. Its a three-storey building with sloping roofs and ornamented verandas built in the style of a Chinese pavilion. The house has a huge collection of sculptures, paintings, furnitures, chandeliers, clocks made of pure gold and one particular 250 year old wall clock, giant Belgian mirrors (10 feet wide and 25 feet high) with detailed golden frames, porcelain vases and urns from the Far East and so many more. The wooden and marble statues of Queen Victoria, Napoleon and Elizabeth I were noteworthy among the various fascinations of the late owner of the palace. There were beautiful, unmissable statues of Apollo, Mercury, Venus, Thalia, Sophocles and Melpomene along with the statues depicting the four seasons and different continents of the world. The features on the statues depicting Asia, America and Africa really caught our attention as very subtly did they point towards where, in those contemporary times, the balance of power lay. America, in the pre-Colombian era, was yet to come to the fore and so the statue was rather that of a native American with an alligator on one side. (It was here, that I protested and brought a recluse conspiracy theory to discuss how reptilian-human hybrids have ruled America over the years. Read about it here). Asia is depicted as a camel-riding woman with sharp facial features and an elaborate head-dress, thus pointing towards perhaps Persia and it's erstwhile grandeur. The imperial states of China and Japan were yet to have a role to play in world politics - strictly according to me. It may not be the case at the time this palace was built, but the statues were built at a time when such was the world history. Moving on, upstairs was the painting room (although there were paintings everywhere) where lay two paintings by Sir Joshua Reynolds: 'The Infant Hercules Strangling The Serpent' and 'Venus and Cupid'. There were also two paintings of Rubens: 'The Marriage of St. Catherine' and 'The Martyrdom of St. Sebastian'. There were a couple of replicas of The Last Supper, some paintings by Italian painter Titian, Bartolomé Esteban Murillo, John Opie, Van Goyen and a couple by Raja Ravi Varma and Bijoy Chandra. The palace is well known for it's sheer opulence and a bygone grandeur and all that is clearly evident. Maybe because it's privately maintained, that it's not in perfect condition. The aviary is full of rare and exotic birds and can even put to shame any government owned zoo. Inside the house, there are a number of parrots, toucans, hornbills, macau and different varieties of parakeet. While outside, notably are a giant Saras crane and a huge pink coloured pelican among antelopes, porcupine and barking deers. It is supposedly the first zoo in India, and the first privately-owned zoo in the whole of Asia. When we were almost done with the tour of the corridor, frequently hushed up by the usher, the guide politely told us to give way to the members of the royal family. We saw a woman, well-fed and fair, walk by us erect and with an air of authority. Never once did she look at us, but still maintained a grimace all the way down the corridor. She was soon followed by a large bespectacled man who was walking leisurely and yet erect with a walking stick in hand. He was wearing a silk dhoti and a kurta, white in colour but with elaborate designs of gold at the border. He looked at us and half-heartedly raised his hand in greeting - assalamu - and soon vanished behind a door. 'Tapendranath Mullick, great grandson of the Raja, and his wife' whispered the guide behind him and ushered us down by the stairs hastily. 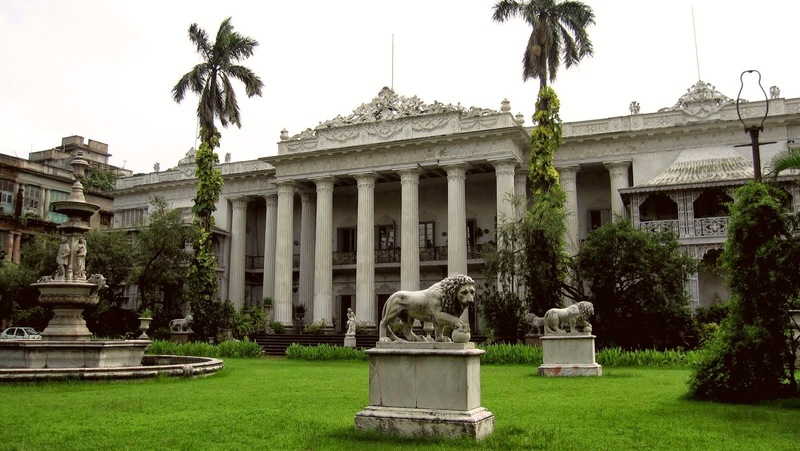 The time for the mere mortals was thus over and the time of the royals has begun in the medieval household of the Marble Palace in the city of Calcutta. Now not to be rude, but I don't do awards and write-up on describing myself on my blog space - it has scared away certain anti-commercial (pretentious much?) readers earlier, of whom I was rather fond of (I call this, the "Aamir-Khan-At-An-Award-Function" Syndrome).. I have posted the award on the lower right-hand panel for widget with a link-back to your blog post though.. and I AM SO HAPPY YOU'VE THOUGHT OF ME FOR THE AWESOME AWARD! :) Lots of love!